Last year I got an HTC Sensation, with which I’ve been very happy (well, except for the ol’ dust-under-the-screen issue, but I can live with that for now). However, I could never get its WiFi hotspot app to work. Till now.I’d spent quite a while googling around, but not found anything. I even tried contacting HTC support, who couldn’t help either, except for suggesting their tried and tested fall-back of a hard-reset, but I’d already had to do that earlier and knew it wouldn’t help. I should say at this point that I’ve actually been very impressed with HTC’s customer service. I’ve contacted them several times now with questions, and they’ve always been very quick to respond and as helpful as possible (including that time I had to hard-reset when I spent the best part of ¾ of an hour in their instant-messaging help). When I contacted them about this, they let me escalate it to their … higher level support (?) as I offered to do some detailed diagnosis for them (I know a bit about networking). Although they haven’t gotten back to me yet; I’ll have to report this solution back to them. The symptoms are that you can turn the WiFi hotspot on, and a second device connects fine over the WiFi network this creates. However, that device can’t then access the Internet. A bit of poking around shows that the Sensation doles out an IP address on the new WiFi network OK, and sets up DNS properly. The client can then lookup names (such as www.google.co.uk) & can ping the Sensation, but can’t ping (or otherwise access) the rest if the Internet. The Sensation refuses to route any packets between the client and the ‘Net (DNS is done via the ‘phone so it’s always a point-to-point job). I even managed to check that the ‘phone’s Linux kernel was configured to route correctly. But still no joy, so I gave up for a while (with such a decent browser, I didn’t now need to access the Net from a laptop or netbook through the ‘phone anyway). But recently, I had another idle google for an answer, and found someone who had posted a fix for their HTC Desire which had had the same issue. I’m afraid I’ve lost the link to that blog, so I can’t give them credit, but a fresh recent google now shows that (now I know what I’m looking for!) it’s mentioned in quite a number of fora. Essentially, it seems to pertain to Orange, whom I have my contract with. I don’t know whether they’ve mucked up something in their SIM setting or what (I have a stock Sensation, not an Orange one), but I’ve not found mention of this issue with anyone but Orange. The HTC WiFi app requires that you have an Access Point Name called “Consumer Broadband”. I was missing this, and without it the app doesn’t crate an Internet connection for the WiFi network to connect with (why it still lets DNS work I don’t know). You need to go to Settings, Wireless & Networks, Mobile networks, Access Point Names. 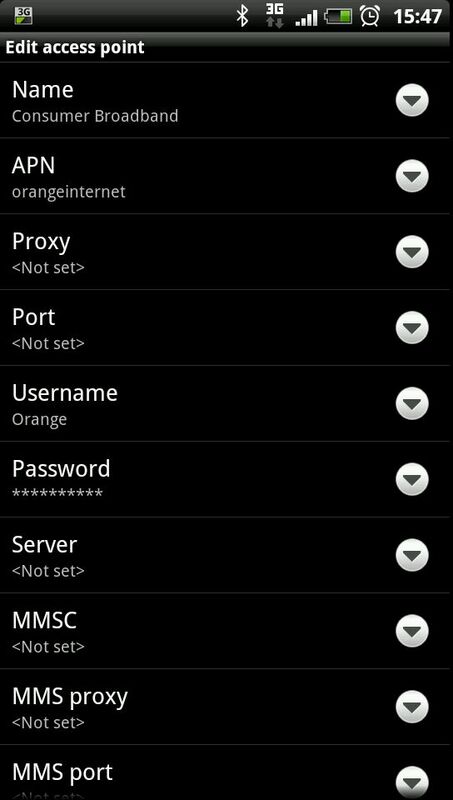 I only had Orange Internet and Orange MMS listed there initially. Did you know you can screenshot with +? The other default settings (some were pre-filled) I left blank or what they were. If you already have a Consumer Broadband APN, check its settings against the ones above. And after that, I started up the WiFi hotspot, tried my laptop … and wa-hay, Internet access! This entry was posted in Tech and tagged android, htc, orange, wifi. Bookmark the permalink. Thank you very much – it works like a charm, and it is a lot easier than the other solution you refer to (related to HTC Desire). My phone is an HTC Sensation; I had as APN name, but with empty settings. Thanks you soooo much~!! now i can online with my laptop~!! So glad I found this site. I am with Crazy John in Australia and they do not publish the settings to correctly enable the wifi hotspot application “pocketwifi”. I had been trying for ages to share the phones data plan with our tablets but no joy. I used the base settings for normal internet connectivity APN and changed the name to Consumer Broadband. Now works like a charm. Thanks. Thanks a lot it worked for me to. I’m with t mobile and I have a HTC sensation xe. My internet was working on and off when I shared it with my laptop and sometimes it would cut out. I was getting really annoyed and frustrated and decided to google to see if anyone else was experiencing the same problem as me and I came across this website. I followed the instructions and it worked straight away. So thanks a lot. Same happens with a new HTC One S on Orange to use wifi hotspot as modem with a laptop, although there is a APN populated for Consumer Broadband, you can’t edit it as Orange Internet is on. All you have to do is create a new APN as shown here also named Consumer Broadband and when select Save it becomes active – hey presto, wifi hotspot works fine! Had a similar problem with getting hotspot/tethering to work on Desire in 2010 on 2.1, Orange tech people had no info and after a couple of weeks found the answer on a forum. This is in response to Jenine. I have a T mobile HTC sensation as well that is having the same issue. What were the exact settings you used to get the mobile hotspot to work again? Did you use the exact settings above? Anyone is free to respond just need this to work again. Thanks for your help in advanced! On top of what’s visible in the screenshot, I then have (these were the defaults) WAP 2.0, MCC 234, MNC 33, everything else “Not set”. I also seem to have a locked, but inactive, alternate “Consumer Broadband” now as well. Maybe turned up when the Orange and T-Mobile connections got joined. It has an APN Type of “dun” instead of “Not set”, so you could try that. I have the similar problem. But my cell was buy at USA unlock of ATT company. I create the consumer Apn. When set on the WiFi hotspot it’s say that is active in 3G and receive a message that I have to ATT.com/mywireles or call at 611 and close. Brilliant. I’ve now got my Nexus 7 connected to my HTC DESIRE so I can use it while mobile. Tried this with Virgin network and HTC Explorer. Could not get it to work at first. But noticed putting on wireless hotspot stopped the internet working! Turned off “connect to the internet”, turned it back on and away it went. I’ve been unable to use the Wi-Fi hotspot for over a year, assuming it was poor signal causing the problem (I’ve only had half a dozen occasions to need to try it in that time!). When I realised it was an actual problem with the phone, a Google search brought me here, and the problem’s fixed in minutes – thank you! rem: What carrier are you with? What APNs do you have listed? Thanks so much for posting this! Can finally use my nexus 7 on tether..
Did you try creating a *new* APN called “Consumer Broadband” as Anorakeric suggested? The only other thing I can recommend is phoning Orange, as occasionally you get lucky and they give you the info. (but it shouldn’t have changed). Brilliant. Worked a treat for me on O2 in the UK with Sensation XE, just when I was about to give up trying to get wifi hotspot to work. Thank you very much. Fantastic to find this – I’ve had a Sensation for a couple of years now and could never find a solution fo the hotspot problem until just stumbling across your page today! I’m with Telstra in Australia and I’ve found out that the standard Telstra.internet APN doesn’t work with the hotspot – you have to use Telstra.iph instead. Your page was a great starting point with all of the info above and a Telstra crowdsupport document about a similar issue with a Motorola defy gave me the APN solution. Thanks again and hopefully this post might help other Aussies with the same issue! would u mind please sharing the settings u used for your tmobile phone…I also have tmobile tried the settings above but still don’t work. For what it’s worth, I now have a spanking new HTC One, and its wifi hotspot worked for me out of the box! Thanks so much. Seems to be the only posting on the internet with this answer. I also have it working on O2 now. Incidentally it was working for me on Vodafone in Australia with my Sensation XE in November 2012 so maybe something broke it since then or ? I am using HTC wildfire s a510b.I can connect from my mobile WiFi hotspot to laptop but I can’t access internet on my laptop.it show the error . pls any one help me…. Hi. I’m in Pakistan and have unlocked EE (Orange) phone. I’ve no APNs already. I tried making new named Consumer Broadband but no other phone connects. Every phone stucks on GETTING IP ADDRESS. Is there any workaround? This has been driving me nuts! My HTC wildfire s, showed consumer broadband as an option but was locked. So I set up a new one exactly as you said, and I am now writing this on my nexus 7 connected to my phone!! You are a hero!